Once again we are approaching the month of over-the-top basketball excitement–March Madness. So much excitement that viewership went through the roof again last year! According to the NCAA, the 2018 series had 97 million U.S. viewers from series beginning to the Final Four! This popular time of year impacts the workplace now more than ever. But you can choose to let them watch! Having good management of employee Web usage is the key to the days of Madness! The things to watch for are the same every year–but they do get better at tricking everyone. So our recommendation may sound familiar but we can’t emphasize enough that at this time of year being proactive and vigilant is so important. Make sure you can see just real Web browsing activity. Some say they show you the Web-use activity but the information ends up cluttered with all the computer communications. Seeing Web browsing activity should not be time consuming and cumbersome. Get a solution that clearly shows you employee Web-use activity without all the computer transactions! Not all ads or search results are real. Security risks are numerous this time of year. March Madness search results have been known for malware. As your employees search for brackets or results, you need to block traffic to the constantly growing number of sites that generate and/or promote malware. Keep out viruses, Trojan horses, phishing attacks, and more. And remember, these searches will trigger remarketing ads that may also contain malware. Restrict sites that are inappropriate or illegal. Be aware of what your employees are doing online. Gambling sites are not just a legal issue but also tend to carry many security risks. Don’t let your bandwidth slow the rest of the business down. Make sure you are able to easily view current data usage for the entire enterprise, detect unexpected spikes that could indicate excessive data use, or just observe the last 5, 10, or 15 minutes of real-time updates. You should also make sure you will be able to keep the critical business operations running efficiently, even during the games, by using bandwidth throttling. March Madness has become a way of life. Decide how your company will handle the traffic and proactively manage it by letting us help protect and secure your business and your employees. Wavecrest’s CyBlock Filtering and Monitoring Suite will help manage your employees’ Web use and protect your business. CyBlock will block sites known for malware, proactively control bandwidth consumption, and keep productivity flowing, while allowing responsible viewing. This year, have the choice to allow your employees some freedom to watch and enjoy! Find out more about all the Web management product lines at Wavecrest Computing. Wavecrest Computing has heard about it every year for 15 years–companies complaining that their bandwidth is slow and their overall productivity is down, all during March and early April! What is going on? Madness, they say…March Madness! For more information on CyBlock and a free trial download, see CyBlock Core Features. The excitement! The fun! The astounding fast breaks, slam dunks and three-pointers! And oh yes, watching it all unfold on your office computer. Who could not like it? Well, for openers, the overworked folks who have to worry about workforce productivity, bandwidth costs, security issues and legal risks. Not exactly good news for businesses and government agencies during this time of troublesome economic conditions and serious budget worries. Maybe it’s time to revisit your AUP and rebrief your workers on the negative impact their fun could have on the organization and ultimately on their own job security. And if your organization doesn’t already have a robust Internet usage management solution in place, it may just be time to look into it seriously. Wavecrest’s Control List includes CBSSports.com and NCAA.com under the Sports category, and for those using Cyfin, access to these sites will be monitored under Sports. If you want to only block and/or monitor the live video, you can create a custom category to block and/or monitor www.ncaasports.com/mmod/player. Concerned About Bandwidth Usage During March Madness? 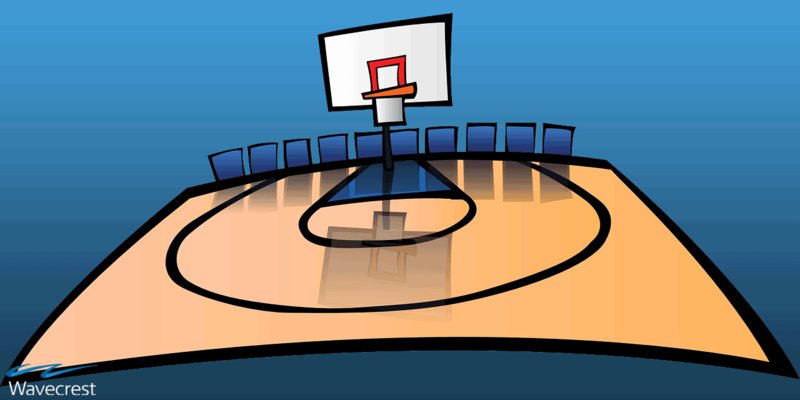 Bandwidth is a main concern for many businesses during this March Madness season. Many must deal with employees using company resources to enter online office pools, blog about the top seeds, and watch live streaming games that take place throughout March and early April. In fact, CBSsports.com is expecting even more viewers online this year. They expect the number of unique viewers for March Madness on Demand, to rise 50% to 7.2 million viewers. With the massive number of sports Web sites and streaming games available, companies can expect to see a considerable drain on employee productivity and network bandwidth during the NCAA Tournament.